Directors Present: Jim Andrews, Linda Barber, George Borrello, Pierre Chagnon, Ted McCague, and Dave Wesp. Others in Attendance: Erin Brickley – Alliance Executive Director, Randall Perry – Alliance Project Manager. Tory Irgang – Chautauqua Region Community Foundation. Linda Swanson – Sheldon Foundation. Bill Boria – Chautauqua County Department of Health and Human Services. Interested citizens: Regis Thompson, John Ford, Doug Champ, Craig Butler, Paul Johnson, Frank Nicotra, Anthony Hopfinger, and Vince Horrigan. Member Representatives in Attendance: John Jablonski – Chautauqua Watershed Conservancy (CWC), Louise Ortman – Town of North Harmony, Doug Conroe – Chautauqua Lake Association (CLA), Jay Bailey & Marla Connelly – NYS Office of Parks, Recreation and Historic Preservation – Allegany Region, Karen Rine – South & Center Chautauqua Lake Sewer District, and Jim Cirbus, Jim Wehrfritz, & Mike LaTone – Chautauqua Lake Partnership (CLP). Mr. Chagnon called the meeting of the Chautauqua Lake and Watershed Management Alliance (Alliance) to order at 4:33 pm. It was noted for the record that there was a quorum (6 of 7) present. Mr. Wesp made a motion to accept the minutes of the 7/12/18 Board Meeting, seconded by Mr. McCague. The motion was approved unanimously. Close-out reporting and reimbursement for older grant is in progress. Discussion: Ms. Barber inquired if trees will be planted at Goose Creek. Mr. Perry advised the live willow stakes had indeed been planted as part of this project but hard to see from the road right after install. They will be more visible as they sprout and grow. Mr. McCague noted that the effects of long range development within the study area was also assessed for this Lakewood/Busti stormwater study and report and suggests work that can be done for local zoning. Ms. Brickley reminded those in attendance of the value of attending past NALMS conferences and that last year both staff members attended and shared written reports with the board, members and community at large as documented in the December 14, 2017 Meeting Minutes. Ms. Brickley advised that the conference will be in Cincinnati, Ohio this year and that Mr. Perry could not attend due to scheduling conflicts, so looking for board approval to send just the Executive Director this year. Mr. McCague made a motion to approve attendance by Ms. Brickley at this years’ NALMS conference, seconded by Mr. Borrello. The motion was approved unanimously. We held a Scientific Committee meeting on July 10th. I shared with the group how I have been in contact with Karey Lawton from Cummins Engine about a potential community project. Cummins was willing to sponsor a representative from the Alliance to attend the Six Sigma training being held in the plant at the end of July. The group discussed a potential project for the Six Sigma approach, but we will meet again this month to further develop an idea since Cassie has attended the training now. There was also a continued discussion on the need to create a clearinghouse of Chautauqua Lake data. The goal is to invest in data that has the same quality controls across the board, and also can be used to build off of past and future research. We circulated a presentation by Scott Kishbaugh from NYS DEC that was presented at the NYSFOLA conference. The presentation was titled “Sorting through the QAPP: The Importance of ELAP and Data Integrity.” The point of this presentation was to bring awareness of Public Health Law: 502, which governs what data state agencies can recognize. Agencies use of data is governed by the existing and future interpretation of PHL 502, so the Scientific Committee would like to keep this in mind when determining report ability and criteria “Plan to measure and report effectiveness” in the 5-Year Implementation Strategy. Mr. Chagnon expressed his appreciation and thanks to Cummins for their generosity for the Six Sigma training Mrs. Brower attended and to Karey Lawton in particular who has been facilitating all of this. Mr. Erlandson asked what Mrs. Brower’s role was on the Science Committee as he does not believe she was a named member when the group was formed. Mr. Chagnon advised that she is there in support of the committee chair, Mr. Spann. Overview:Mr. Chagnon had advised several local funders are interested in seeing increased governance capacity at the Alliance as we are experiencing an evolving role in the community. In order to ensure full understanding of their expectations, Mr. Chagnon formed an ad-hoc governance capacity committee comprised of Mr. Shepherd, Ms. Barber and Mr. Horrigan. Mr. Horrigan reported to the board the following month that their committee had met with funders and key lake and watershed members and in general terms they would like to see more stakeholder input. Mr. Butler asked who would be eligible to be on these new committees and was advised that is still to be determined but focus is on member participation but experts/specialists may be needed in certain circumstances. Mr. Champ commented that tourism should be a focus of one of the new committees and was advised that we all understand the economic considerations of lake health and management but unsure if this is the key focus for the Alliance. However, this can be looked at as an option. Mr. Cirbus suggested the proposed Lake Maintenance Committee be named Lake Improvement Committee instead and also suggested creation of an Allocations Committee that could be structured similarly to the local United Way. He was advised these are the types of feedback the committee is looking for and to send all comments, inputs and suggestions to Ms. Brickley by end of August for consideration. 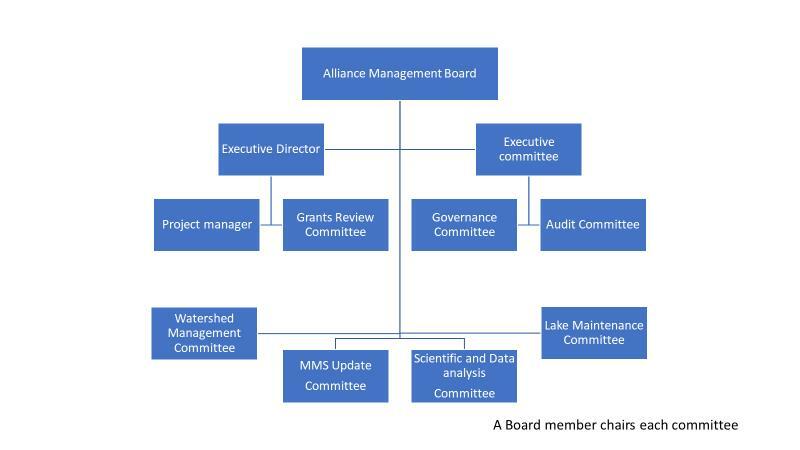 Ms. Barber said she felt the proposed committee structure adds more active roles / opportunities for lake and watershed groups within the Alliance which will build more credibility with local funders and maximize the expertise of our member organizations. Mr. Wehrfritz questioned whether Chautauqua Institution should be listed under Community class as he feels they are a small player. He also commented he feels that if the relevant lake and watershed organizations do not all have a direct representative on the Alliance board, then choosing committees by a board that is not fully collaborative will impact the relevance of any new committees. Mr. Horrigan noted that Chautauqua Institution gets its drinking water from the lake which is one of many reasons why they are a relevant community group. Mr. Conroe advised that he agrees with the CLP and believes that each lake and watershed organization should have a representative on the Alliance board and is troubled by considerations being given by local funders. Ms. Barber commented that this is a draft and these recommendations can evolve as feedback is given, much like the Alliance itself is evolving. Mr. Horrigan reiterated that comments should be sent to Ms. Brickley by August 31st. Overview: At the June 2018 meeting, Mr. Chagnon advised that Ken Shearer submitted his letter of resignation from the board dated June 12, 2018 effective as of that date. At the July 2018 meeting, Mr. Spann announced he would be stepping down effective at the end of July’s meeting. Members sent nominations for candidates for director positions to Ms. Brickley which was then communicated by email to all Members via email 8/7/18. As directed by the by-laws, the Governance Committee will then review the candidates and provide a recommendation to the Board for action at our next meeting. Update: Mr. Chagnon noted that we now have two at-large director openings and four nominees: Jay Bailey from OPRHP – Allegany Region, Hugh Butler from County Chamber of Commerce, Jim Wehrfritz from CLP and Bruce Erickson from CLA. The Governance Committee decided after discussion that some candidates are unknown to some sitting directors and therefore, we will proceed with interviews with each of the four nominees. This will be scheduled in the next couple of weeks based on director and nominee schedules and the goal will be to have recommendations for the top two at next month’s meeting. Mr. Cirbus inquired about the timing for the recommendations for the top two given the draft recommendations that the ad-hoc governance capacity committee just presented which would add two brand new at-large positions. Mr. Chagnon commented that that has not been determined but that this could be a one step process or two step process depending. Mr. Chagnon inquired with the board of their preference. Since none was forthcoming, he commented that if we are unsure, then he suggests moving forward with the interviews and the board can decide next month whether to make this a 1 step or 2 step process. Mr. Cirbus questioned the stormwater projects that were primary outputs of the Lakewood / Busti Stormwater Study and commented he believed that kind of money could be better spent elsewhere. Mr. Cirbus also commented that CLP feels disappointed with their Alliance membership and doesn’t feel they have gotten much public support from this Alliance for CLP’s accomplishments. He would like the board to take a public position on herbicides. Mr. Wesp responded that he disagreed with Mr. Cirbus’ request as the Alliance must take into account all of the various stakeholders and member organizations. Ms. Barber commented that she would hope the grant awarded to the CLP from the Alliance in June for a portion of their SEIS costs be considered when making these comments. Mr. Wehrfritz commented that the Alliance should be actively facilitating better working relations between various organizations. Mr. Borrello commented that a primary focus was to evolve from the Chautauqua Lake Management Commission, which was more of the active at-large organizations’ commission, by pulling in more participation by the various municipalities. It was felt that more participation by the municipalities was key to securing more outside grant funding. This was part of why the County supported the creation of this Alliance as a new non-profit and in that regard we have seen successes. Mr. Champ commented that he doesn’t belong to any one particular group so he doesn’t have to align with any given singular focus and believes there is value in his approach. All actions taken should be well planned and assessed for all possible impacts and that sometimes this takes evidence accumulated over time. Good science is the best approach and not personal points of view. Ms. Connelly advised there had been no beach closures at Long Point State Park thus far this year. Mr. Boria commented that Lakewood beach often acts as a canary in the coal mine for algal blooms and is currently open for use. Mr. Conroe noted the upcoming third annual Dragon Boat Race in Celoron this Saturday and to come out and enjoy. Mr. McCague motioned to adjourn at 6:03 p.m., seconded by Mr. Borrello. The motion was approved unanimously. Ad Hoc Committee tasked with governance review and recommendations. Draft recommendations broken down into two areas. Note: Board vacancy interim appointments must be voted on at next annual meeting. Committee reports will be included on the monthly Board meeting agenda with minutes submitted. This framework is ready for review and comment by the membership. Please submit comments to Erin not later than August 24th who will distribute to the Ad Hoc committee.